I loved creating this one! It was my friend’s birthday, and she likes marble cake. Well I actually ended up making two cakes this time. I made an extra one just like hers so I could photograph the inside of the cake. They are 6″ cakes, so not that big of a deal. The sponge is marble, as you can see. We brush each layer with simple syrup, to keep our cake moist. Fill them with Chocolate Swiss Meringue Buttercream. Cover with one layer of Chocolate Swiss Meringue Buttercream, that will act as a crumb coat. Then, frost the cake with the Vanilla Swiss Meringue Buttercream. Let it get hard in the fridge. Frost with another layer of the Vanilla Swiss Meringue Buttercream. Chill cake again. You want the cake to be very cold when it’s time to do the ganache drip. For the drip, make sure you have the ganache at the proper consistency. 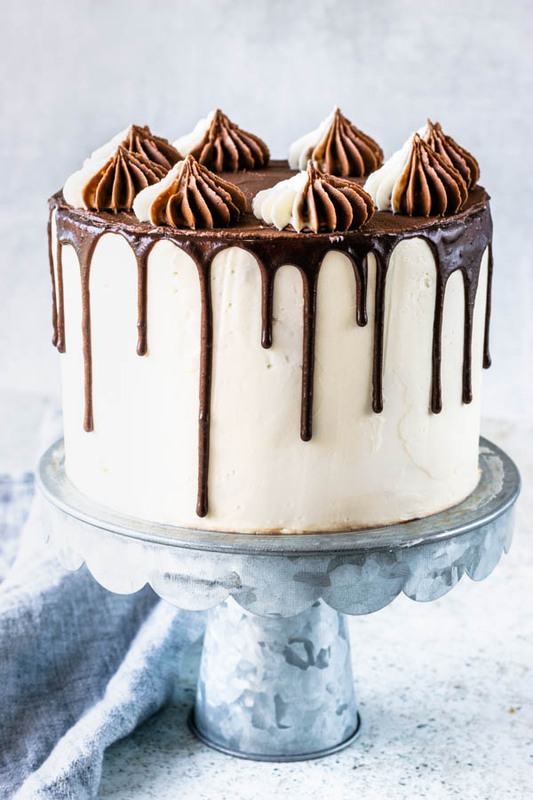 The perfect ganache for drip cakes shouldn’t be too runny, or too stiff. Make sure to drip some on the back of the cake, to see how it drips, before you start. If the drop goes all the way to the half of the cake or so, and stops, you’re usually good to go. Then you can control your drips, making them longer or shorter, depending on the amount of ganache you pour. For the bicolor frosting piped on top, simply lay out a piece of plastic wrap on the counter. spread one layer of chocolate frosting crosswise. Right next to it, spread one layer of the vanilla frosting. Roll the plastic wrap into a tube. Insert tube into piping bag fitter with the tip you are going to use. This is the one I used. For troubleshooting with Swiss Meringue Buttercream, please refer to my Macadamia Coconut Cupcakes. 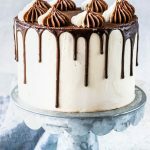 I explain in detail how to troubleshoot your Swiss Meringue Buttercream and give you tips on how to succeed at making this delicious frosting! 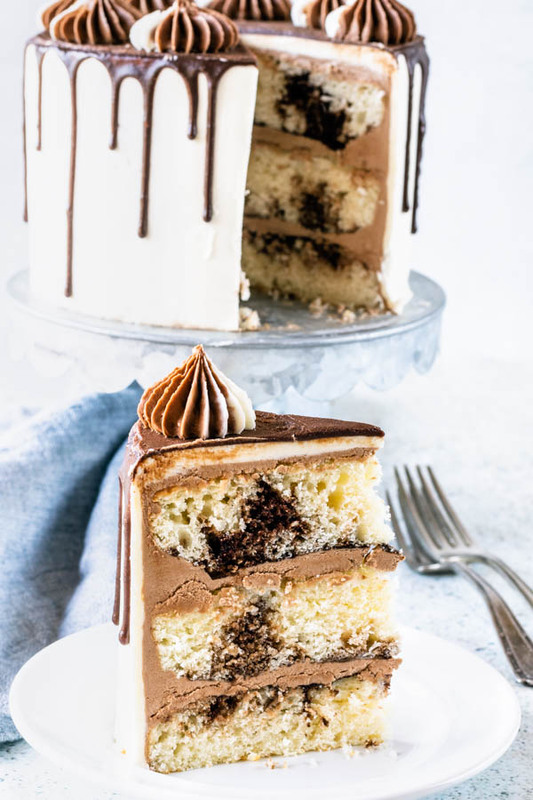 I hope you like my Marble Layer Cake! I made it with a lot of love. And it was a delicious cake! I brought the some of it to my job (whatever wasn’t eaten by my son and husband). If I had kept it at home, I would probably have eaten the whole thing! You might want to check out some more of my cakes. 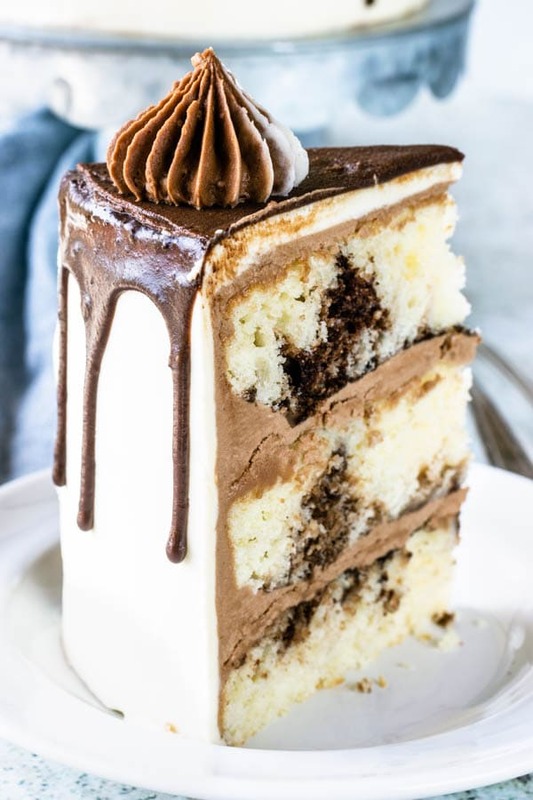 Marble Layer Cake. Inside, marble cake. The filling is a Chocolate Swiss Meringue Buttercream, and outside, Vanilla Swiss Meringue Buttercream, topped with chocolate ganache. Grease and flour 3 6” cake pans, or 2 8” cake pans. Add eggs to the mixture, one at a time, mixing on medium speed. Scrape bowl and add vanilla. Mix on medium-low speed until incorporated. Notes: If you don’t want to use coffee, you can use boiling water. Just mix 1 teaspoon of espresso powder in with the dry ingredients or skip it all together. Sift together flour, cocoa powder, baking powder, baking soda, salt, and espresso powder, if using it instead of coffee. Set aside. Whisk egg in a bowl for about 30 seconds. Add sugar and keep whisking for about 1 minute, until brightened in color. Add oil to the bowl. Whisk until combined. Pour dry ingredients over wet mixture. Fold with a spatula slowly, until ingredients are just combined. If you see big clumps of cocoa powder, you can use the whisk to try to smooth the batter out. Once batter is incorporated, pour hot coffee in the bowl. Whisk until combined. Batter will be very thin and runny. With the back of a spoon make holes in your vanilla cake batter. Spoon Generous amounts of filling inside these holes, being mindful to spread them evenly between all the cakes. Grab a knife and run it over your batter, creating a swirl effect, to make the beautiful marble. Bake cakes in pre-heated oven for about 20-25 minutes. Smaller cake pans will take less time to bake. Let cake cool in the pan for 10 minutes and flip it over in a wire rack to let it cool completely before proceeding with frosting and filling. Now, divide your Swiss Meringue Buttercream into two different bowls. In one bowl, add 340 grams (12 oz) of the cooled chocolate ganache (recipe below), which is half of it, beat with the paddle attachment until creamy and incorporated. Use a spatula to help. Chop the chocolate finely. Extremely finely. Bring heavy cream to a simmer over medium heat in a small sauce pan. Once you see the first bubbles emerging, pour hot cream over chocolate. Mix with a spatula to combine. Make sure all chocolate melts. If you see little pieces of chocolate that aren’t melting, microwave for about 10 seconds at a time, stirring in between, until all little specs of chocolate have melted. Set ganache aside to cool. Half of the ganache will be used in Chocolate Swiss Meringue Buttercream. The other half will be used to be poured on top of the cake. You might have leftover ganache. Store ganache in the fridge for up to 1 month, covered. You want the consistency of the ganache to be just perfect. 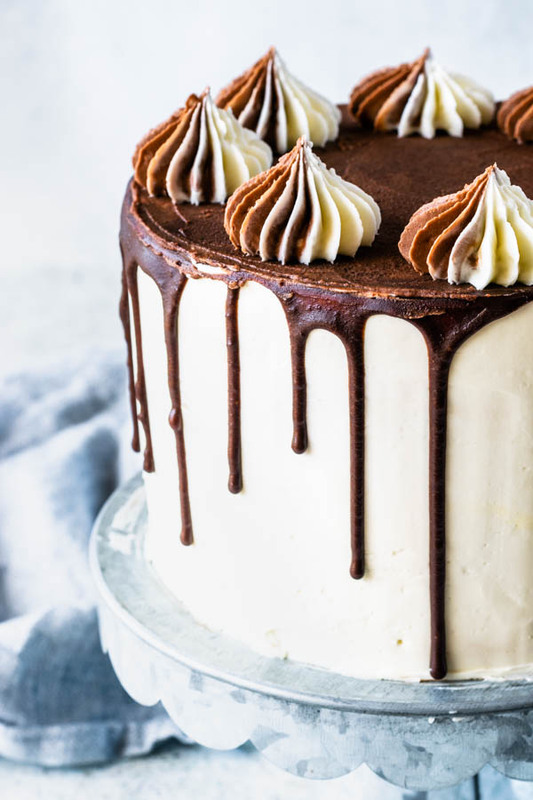 You don’t want the ganache to be even slightly warm when you add it to the Chocolate Swiss Meringue Buttercream, because that will melt the butter in the frosting. Make sure your ganache is 100% cooled. I also like to insert the ganache in the fridge for about 1 hour before I add it to the Swiss Meringue Buttercream. I like to brush my cake layers with simple syrup. Simple syrup is basically equal amounts of water and sugar brought to a boil and then cooled down. I keep a container of simple syrup in my fridge. You will use about 1 cup of simple syrup for this cake, so boil together 1/2 cup of water and 1/2 cup of sugar, let it cool down and brush it in each layer before frosting it. Fill cake layers with the Chocolate Swiss Meringue Buttercream. Cover with one layer of Chocolate Swiss Meringue Buttercream. Let it cool in the fridge until solid. Now cover cake with a layer of the Vanilla Swiss Meringue Buttercream. Follow instructions bellow for the ganache drip. You are going to use half of the ganache to add to the Swiss Meringue Buttercream frosting. The other half, will be used to be poured over the cake, for the drip effect. The ganache has to be at a very particular consistency to be poured over the cake. Test a few drops on the back of the cake. You want the drip to go almost all the way to half of the cake once you pour it on the edge of the cake. 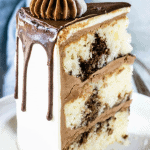 If it’s not reaching the middle of the cake height, you might want to microwave the ganache for a few quick seconds (3-5), and stir in between, until you have achieved the perfect consistency. If ganache is dripping way too fast to the bottom of the cake means it’s too runny. Simply place ganache in the fridge for a few minutes, stir, test again. Repeat. It’s all a matter of having the perfect consistency where the ganache won’t be too runny, or won’t be too hard. After doing the drip on the cake, top with the bicolor frosting! What a gorgeous marble cake and you make it look so easy to prepare. My mom made marble cakes when I was growing up and they didn’t look as good as yours do. MMMMMM this looks so perfect! I love layer cakes- they seem to add an extra bit of love! And this cake is beautiful on top of that! Marble cakes can be tricky when homemade. This is a great recipe! This cake is absolutely stunning! Delicious combo and perfect for birthdays! So beautiful how could you eat it?!! I would have to make two – one to look at while I eat the other – problem solved!! This cake looks amazing! What a show stopper — it’s beautiful! Wow, This cake looks absolutely amazing, I must try! This looks incredible! Happy birthday to your friend – I’m sure she loved this cake! This looks delicious! I want to make this for a baby shower later this month. Can I sub the coffee out for something so the Mom to be can have a slice? Thank you! Absolutely! You can sub for hot water it will work just fine and it will be delicious!!! Thank you so much Kathleen!!! Have fun at your baby shower!